Sheet 'Zones of France'. Second Edition. 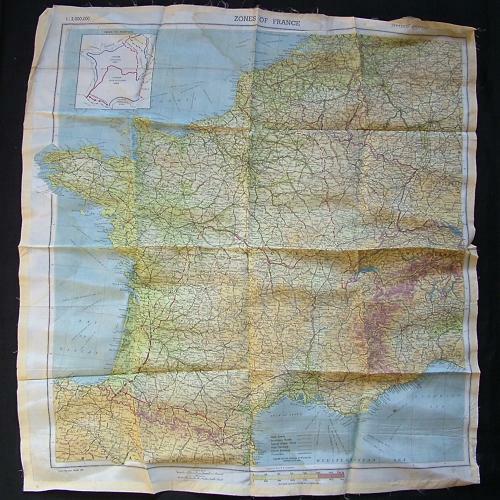 Large single sided colour silk/rayon map, approximately 55 x 55cm. Scale 1 : 2000,000. With inset of frontiers. This was the map issued to troops and aircrew on D-day. Marked I.S.9 (WEA) MAR 44. Raw/unhemmed edges. The map has some light marking and stains but retains strong colour. Minor edge fraying in places. Folded/creased and would benefit from careful pressing/ironing. This is the map that everyone wants! Stock code E22824.